I have another cute card to share using the Unity Stamp Company sentiment kit. This time I’m creating a repeat pattern background with the help of the MISTI. These little cacti are too darn cute. I love the set of three and so many different sentiments to choose from. You’ll definitely find something for any occasion. Oh my, a pink cactus? Yep. That totally happened. I wanted the cactus to really pop against the black and white background and to be extra cute. What says cute and fun more than a pink cactus??? I don’t know, but that is what it said to me. 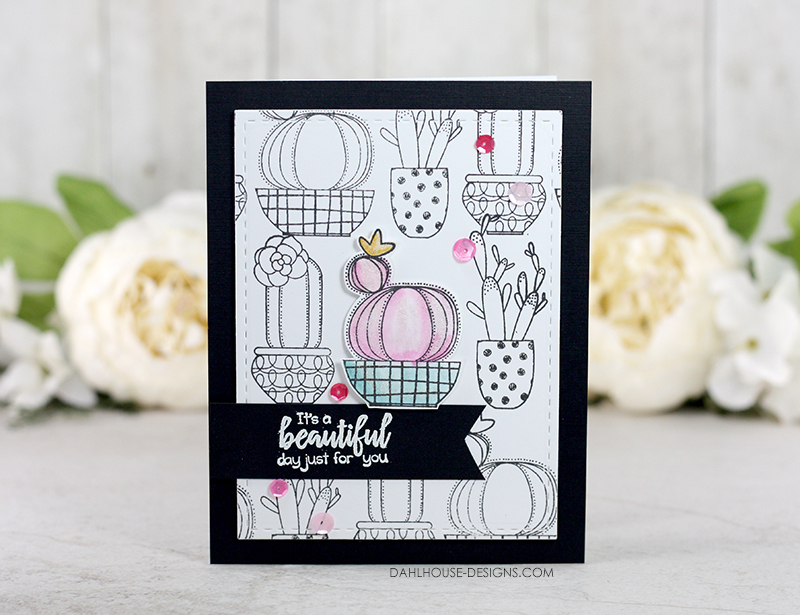 I used my MISTI to create the patterned background and then some Distress Inks to watercolor the pink cacti. The sentiment is embossed in white and then cut into a banner shape. It all turned out super cute and really quite easy to recreate. Start with a standard size A2 card (4.25″ x 5.5″) card covered in black cardstock. Die cut a piece of white cardstock and place into MISTI. Place a transparency or clear acrylic sheet over the top of the cardstock in the MISTI. Stamp the image once onto the clear sheet. Remove and stamp onto the cardstock. 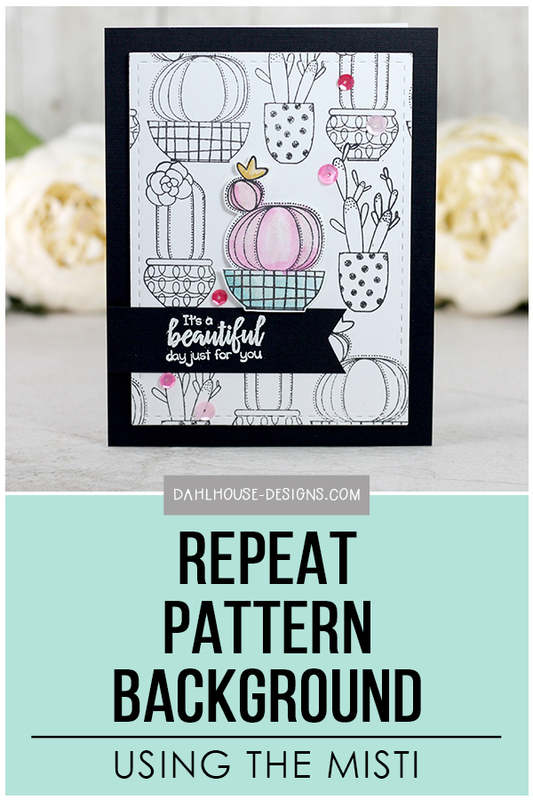 Replace the clear sheet and reposition the cardstock underneath repeatedly until you have stamped the image over and over again to create a repeat pattern of the stamped image. Take patterned panel and pop it up on the card base with foam adhesive. Stamp the center cactus on cardstock and watercolor with Distress Inks. Fussy cut out and pop up on card with foam adhesive. 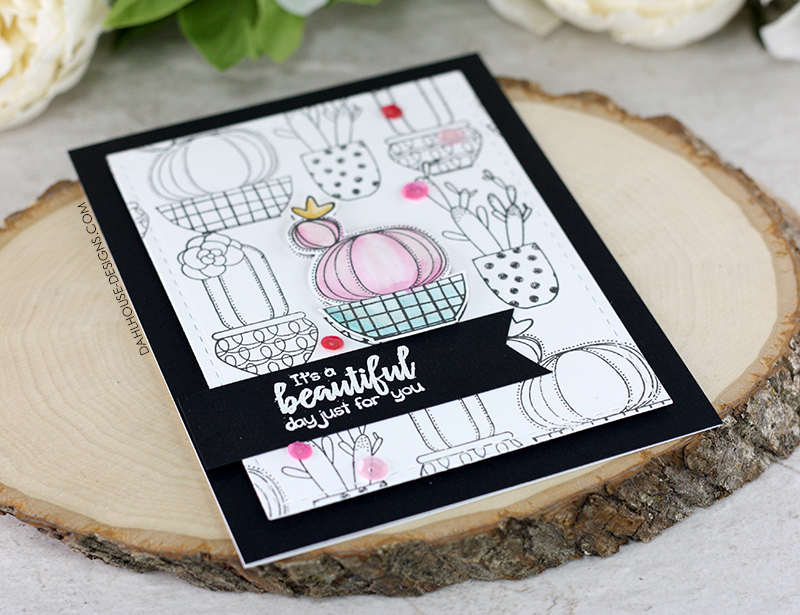 Stamp sentiment with Versamark ink on black cardstock. Emboss with white embossing powder and trim down to a notched sentiment banner. Adhere to card with foam adhesive and tape runner. Add sequins to card with Glossy Accents and then add a bit of glitter to the watercolored cactus with a Wink of Stella clear glitter pen. Lisa, your card is fabulous and sweet. Love the technique you used. Thank you also for the tips how to use MISTI with rubber stamp. I gotta try it.